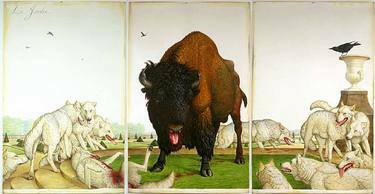 Walton Ford is an American artist who paints large scale watercolors in the style of Audubon's naturalist illustrations. Each painting is a meticulous study in flora and fauna, while being filled with symbols, clues and jokes referencing a multitude of texts from colonial literature and folktales to travel guides. Ford's paintings are complex narratives that critique the history of colonialism, industrialism, politics, natural science, and man's effect on the environment.